Outpatient Magazine February 2017 Capitalize on Bundled Payments Is Your Compounding Pharmacy Safe? Advances in Refractive Cataracts Boost Your Adenoma Detection Rate Did Skin Prep Fuel This Fire? Alcohol-based skin preps cause only 4% of OR fires, but you must still exercise care when applying these flammable agents. 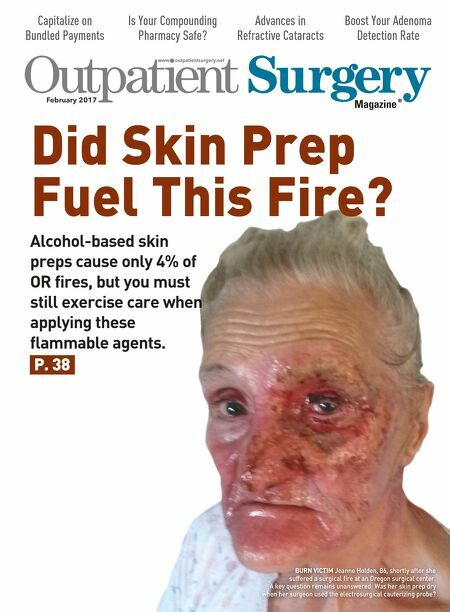 P. 38 BURN VICTIM Jeanne Holden, 86, shortly after she suffered a surgical fire at an Oregon surgical center. A key question remains unanswered: Was her skin prep dry when her surgeon used the electrosurgical cauterizing probe? Ideas That Work: Can You Spot These 7 Medication Label Errors? Coing & Billing: How Much Are You Leaving on the Table? Did Skin Prep Fuel This Fire? Image-guided ENT: The New Standard? Does Size Matter When It Comes to Surgical Displays?